So, who do I like as our Republican presidential candidate in 2012? Parodying the song recorded by The Shangri-Las: "The liberal media is always putting her down (down, down). They said, she came from the wrong said of town. They told us she was bad. Then I knew she was the best we had. That's when I fell for the leader of the pack." Who am I singing about? Obviously, the one and only Sarah Palin. Folks, it is a bit too early to go "all in" on any presidential candidate. I really like Herman Cain. But when I think of the one person who appears to be uncontrolled by liberal media attacks — who epitomizes the kind of "in your face" no-holds-barred approach to attacking Obama's horrific record, and whom we tea party patriots are so desperately longing for — hands down it is Sarah Palin. I know. I know. Republican elites and conventional wisdom say, "Be reasonable. Palin is too toxic. She could never win. Pick an electable candidate like Mike Huckabee or Mitt Romney." When Obamacare first became law, Huckabee said repealing it would be difficult. He suggested that we try to find some good in it. My mental buzzer went off, "Wrong answer." On Limbaugh's radio program, Donald Trump cautioned Paul Ryan to work with the Democrats and not be too aggressive about moving forward with his budget proposal. Again, Trump set off my buzzer, "Wrong answer." "Working with Democrats" ALWAYS means compromising our values, principles and desires. We want conservative representatives with backbone in Washington fighting on our behalf. Yes, the liberal media will portray them as Satan incarnate. But, there's a new sheriff in town called the Tea Party and we have our representatives' backs. The liberal media is planning a sequel to the McCain/Obama race in which they pick our "moderate" losing candidate. Once again, the liberal media is telling us who is "too tea party" to win and why we should pick a moderate to run against Obama in 2012. The title of the liberal media's sequel is "Sucker the Conservatives Two: This Time We Really Think You're Stupid." Let me tell you what I think about moderates. Even Jesus had a problem with moderates. He said, "You are lukewarm — neither hot nor cold, I will spew you out of my mouth." In other words, for crying out loud, have the backbone, character and conviction to take a stand for something. The liberal media wants to set us up with another moderate linguine to lose AGAIN! The 2012 presidential election is going to be all about Obama, mmm, mmm, mmm! Thus, we need a candidate who understands this reality and will boldly go after Obama politically — someone with All American John Wayne true grit committed to tea party principles. So far, our John Wayne is a Momma Grizzly. 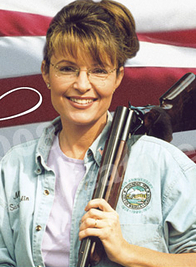 Now, regarding the issues, Palin is pretty much on the same page as most of us tea party patriots: drill baby drill, smaller government, etc. And once again, I must cite her boldness and confidence when espousing her conservative beliefs. You never see Palin dancing around questions from liberal media hacks trying to make her conservative ideas sound mean, heartless, stupid, and racist. It is extremely refreshing and encouraging to see someone on our side fearlessly challenging the liberal media! I pray that whoever we select as our presidential candidate will grasp the seriousness of the situation in which we find our country. Various potential Republican presidential candidates are good people with great conservative ideas to get our country back on track. The most important criterion for a candidate to win my support is a willingness to launch a shock and awe, all-out assault on Obama's horrific record and terrifying agenda. Obama has the bully pulpit of the Oval Office, his Democrat minions, racist black so-called civil rights groups, and a sycophant liberal mainstream media all working in concert for him to be reelected in 2012. America cannot survive another Republican presidential candidate committed to "playing nice" for fear of being called racist. As they say in AA, "Half measures avail us nothing."